. duo show announcement . The artists attend the opening. Being sheltered by a solid professional and personal partnership, that has lasted for over than ten years, Ana Maria Micu and Cătălin Petrişor work side-by-side, in a complementary and harmonious way of perceiving reality through the means of painting. Voluntarily set aside from the tumultuous, but fragmented Romanian Art scene, in the sunny town of Craiova, they have nothing but themselves, their well-preserved, sacred, personal environment and a neverending, complex and intense fascination for the uniqueness of reality, for the continuous transformation of a contemplative, emotional estate and for the eternal and fashionable, philosophical meaning of a so-called mystère des objets. All this emotional flow is thoroughly combined with a very sharp and allusive way of depicting the surrounding reality, by emphasizing in the same way all the parts of all objects. With this simple, but deeply engaged solution, the mystery of objects is inherently present in this inconvenient clarity, which makes us think that there should be something more to explore. 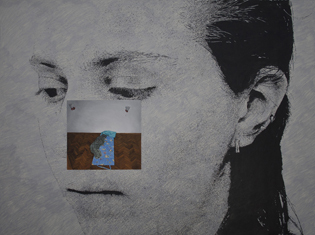 The novelty in this current exhibition is related to the emotional juxtaposition and the physical superposition of two separated images, generated by the memory of the same author. We cannot know which reality is involved, therefore we have to admit that, concerning these images, we are talking about the juicy and modern concept of parallel realities. Micu and Petrişor investigate their inner selves by representing those parallel realities and, sometimes, unfamiliar, awkward objects that just burst into their calm, peaceful and usual surroundings. Temporary blindness is just a matter of choice, and not an uncontrolled, distressful fact. You just choose what you want to see. 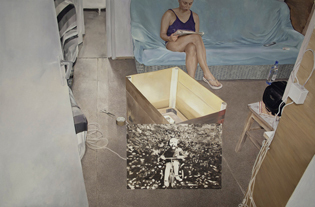 With a perpetual changing framework, painting has been sliding along correctness of form and fidelity of rendition, especially after the proliferation of Photorealism in the end of the 60s and the beginning of the 70s, when the soul of the artist, all his emotional profile has been suppressed for the sake of an antagonistic and seldom offensive reality. In order to paraphrase Baudrillard’s thesis in Simulacra and Simulation (1981), we are talking about something simulated, which has never really existed, but it appears as a visual object in the bidimensional context of a canvas. In Micu’s and Petrişor’s complementary paintings, all these objects signify something personal, because they do harmoniously and relentlessly coexist with their owners and they did that for a while. They created a life of their own. Simona Vilău (b. 1983) is a curator and art writer living and working in Bucharest. She is a freelancer involved in many projects along the last decade, from curatorial projects and research, to artistic projects of her own. She is the creator of Artbank Romania online platform and holds a Ph.D. since 2012, on a theme related to the violence of the image in Romanian contemporary art. 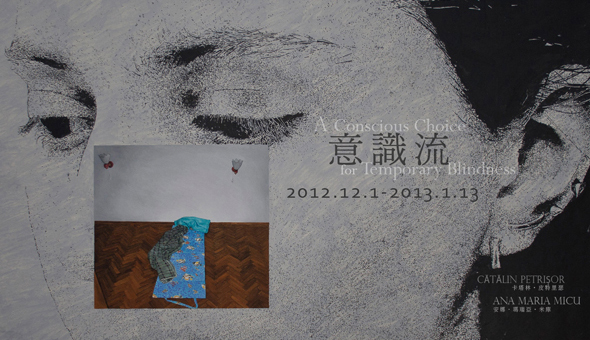 .my works within the project . I updated my website! Did you notice? Check out my new works! Micu graduated 8 years ago from the MFA of the University of Art and Design of Cluj-Napoca in Romania .